Along the journey, the creations are delicious. And yet ... so far ... none yet matches the pudding-desination-in-my-mind with its pockets of creamy custard barely sweetened with tomato. Version V is heavy on eggs and so more quiche-like than bread pudding-like. It's time to switch gears with a whole new approach. Will Tomato Bread Pudding VI be the one ... or just one more windmill? FOR THE RECORD ... It was tomato bread pudding that launched last fall's obsession with slow-roasted tomatoes. I'm still enjoying the goodness that is local, slow-roasted tomatoes. To see how they've been used, see the Slow-Roasted Tomato section in the Recipe Box. Saute until soft and beginning to brown. Preheat oven to 375F. 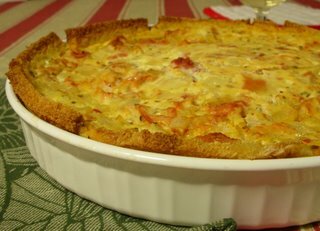 Butter a quiche dish. Remove the crusts from the bread. Cut pieces to line the upright edge of the pan. Cut or tear pieces to fill in the bottom of the pan. In a food processor, blend the cheese with a splash of the half 'n' half, then add remaining ingredients (except tomato) and process just til blended.Gently stir in the tomatoes and onion mixture. Gently pour custard mixture into pan. Bake for 55 minutes or until a knife inserted into the center comes out clean. Cover loosely and let rest for 15 minutes before serving. Rewarms well. Not bad cold! When you see this ♥ or ◄ in the title and the Recipe Box, you know the recipe's a personal favorite. Tastes vary, of course, but the mark is one indication of another vegetable recipe that's worth paying attention to. It does sound good, although I would need to use whole wheat bread to keep the South Beach Diet police happy. I've never cooked anything quite like this and you're inspiring me to try it. i have been on a bread [and butter] pudding craze since Derrick at Obsession with Food did the stale bread IMBB featuring a morels and asparagus one. At the weekend I made a potobrllo mushroom and bacon one, but it didn't last long enough to take a picture. That looks awfully yummy! I love cheesy bread puddings. There's a great recipe in The Greens Cookbook, but its very indulgent! I think tomatoes are often (oddly) tricky, as in quiche. What was the Russian cheese you used? I am thinking of making one this week as I have some soft dinner rolls that need to be used. You can be sure that when my garden tomatoes finally ripen ... I will be trying this! Lovely! Oh, that looks heavenly!!! Darn, I'm so hungry now--and I can't snack. Stephen - It's you I thank (or blame!) for perpetuating this bread pudding quest. But it's interesting, in the classic journey-destination balance, as much as I'd like to find what I seek, I'm much enjoying the side roads and detours and delays. PS And I'll remember your thoughts on the water bath. It's not hard: just another step. And you know that I'll zap those in a nano-zap. Catherine - Sorry, I don't remember the cheese, it might not even have been labeled given its source. I'd love to see the Greens Cookbook decadence! Yvonne - I really recommend the slow-roasting so you'll want to use your meatiest tomatoes. Sher - Snack? This is no snack, m'dear! Sounds wonderful! Will really need to baby those tomatoes in the garden to use in this recipe.